“In Africa, groundwater is the major source of drinking water and its use for irrigation is forecast to increase substantially to combat growing food insecurity,” yet, a lack of quantitative data has meant that “groundwater storage is consequently omitted from assessments of freshwater availability,” according Alan Macdonald, Helen Bonsor, and Brighid Dochartaigh of the British Geological Survey, and Richard Taylor of University College London, writing in Environmental Research Letters. The authors hope to remedy this with new research presented in “Quantitative Maps of Groundwater Resources in Africa.” They used estimates compiled from geologic data and 283 aquifer summaries from 152 different publications to quantitatively visualize, for the first time, the full extent of Africa’s groundwater resources. Tapping into this massive resource is not always straightforward, however. The largest aquifers, and those most able to support high yielding bores, are concentrated in the arid regions of North Africa. The depth of these aquifers and their distance from major populations creates substantial economic challenges for extraction. 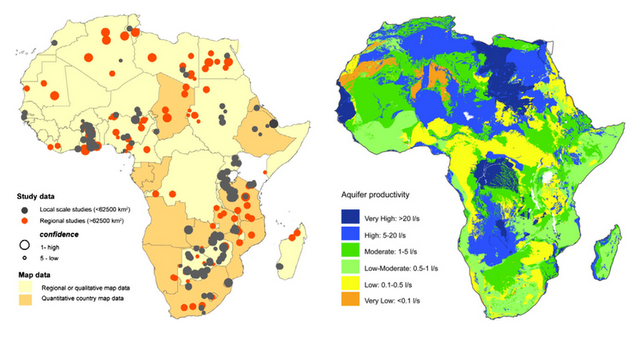 Throughout Africa, “groundwater provides an important buffer to climate variability and change,” say the authors. But these buffers are not a singular solution to the threat of future water scarcity. As the analysis shows, most aquifers, especially south of the Sahara, are unlikely to sustain boreholes of a higher capacity than that required by community-level hand pumps (one liter per second of flow at minimum). Yet, commercial irrigations schemes and urban towns typically demand boreholes greater than five liters per second, according to the study. So, groundwater extraction may help communities and some small-scale farmers maintain access to water, particularly because many aquifers are found to possess the storage capacity required “to sustain abstraction through inter-annual variations in recharge,” however, “strategies for increasing irrigation or supplying water to rapidly urbanizing cities that are predicted on the widespread drilling of high yielding boreholes are likely to be unsuccessful.” Especially, the authors assert, where drilling precedes detailed local scale mapping of the available resources. Image Credit: Figures 1 and 3, courtesy of Environmental Research Letters.